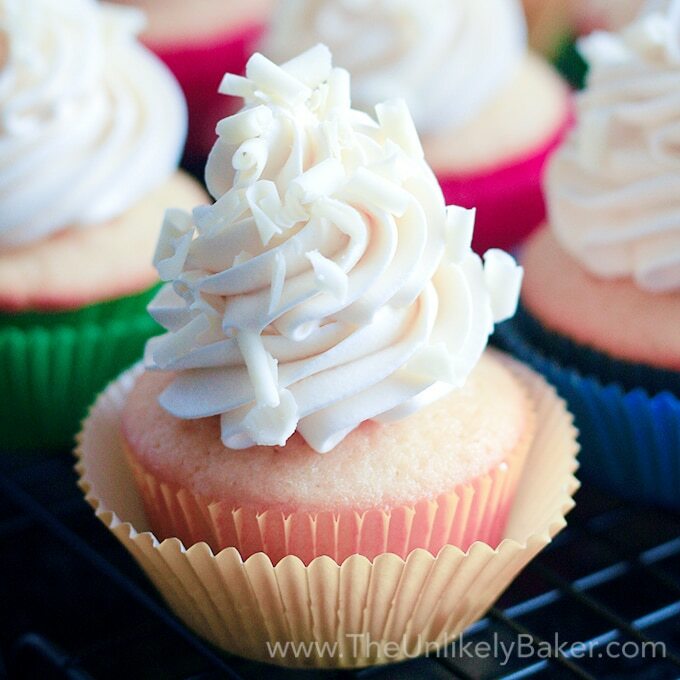 Imagine white chocolate cupcakes with raspberry filling then topped white chocolate cream cheese frosting. Definitely a luxurious and indulgent treat for white chocolate fans. So far we’ve done 3 delicious gift ideas: Very Chocolatey Chocolate Crinkles, Soft and Chewy Ginger Molasses Cookies and Homemade Chocolate Bark. All of these recipes are easy to make and the gifts, universally loved. How about today we do cupcakes? Specifically white chocolate cupcakes with raspberry filling? Now my boss (lovely woman, in case she’s reading this) is a chocolate purist. She only eats unadulterated, high quality chocolate. And she’s constantly reminding me that white chocolate is not chocolate. How can it be? It doesn’t have cocoa in it. I ignore her of course. So these white chocolate cupcakes were born. Not only do they look like Christmas, they are also delightful. I have to admit however that when I first made these cupcakes I was a little disappointed. Sure, white chocolate has a very subtle flavour to begin with but I just couldn’t taste even a hint of it in these cakes. All I could taste was the vanilla and the cream cheese so I sadly put the batch in the fridge fully intending to forget about them while I thought of ways to up the white chocolate flavour next time. I was pleasantly surprised the next day when I tried the cupcakes again though. The flavours came together beautifully. The cupcake, the frosting, the filling – it was delicious. And I can actually taste the white chocolate. Subtle still, but enough. (or any jam of your choice) is completely up to you. I did half with and half without and both tasted good. I did like the ones with raspberry better – the flavours just complemented each other so well. Experiment and see which version you prefer. 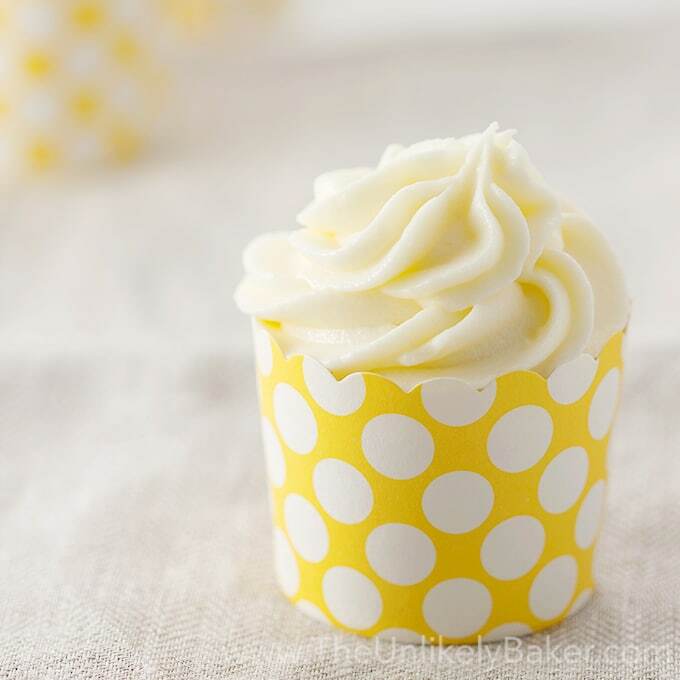 to fill the cupcakes but if you don’t have one simply take a small knife, cut a small hole in the middle of your cupcake about an inch in diameter and spoon the jam in there. I prefer to put the cupcake back as a lid but you don’t have to. It doesn’t matter either way – the hole will be covered in frosting later. Also, serve these cupcakes at room temperature. The cakes will be rock hard out of the fridge but at room temperature they will return to their moist, flavourful selves. 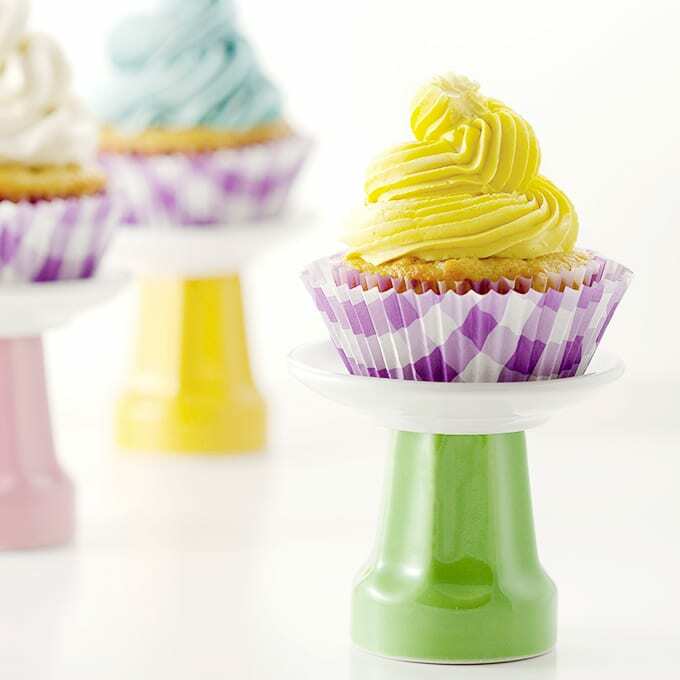 Cupcakes have shorter shelf lives than cookies so plan your gift giving well. Or just bake them for yourself. They are delicious and a wonderful treat. 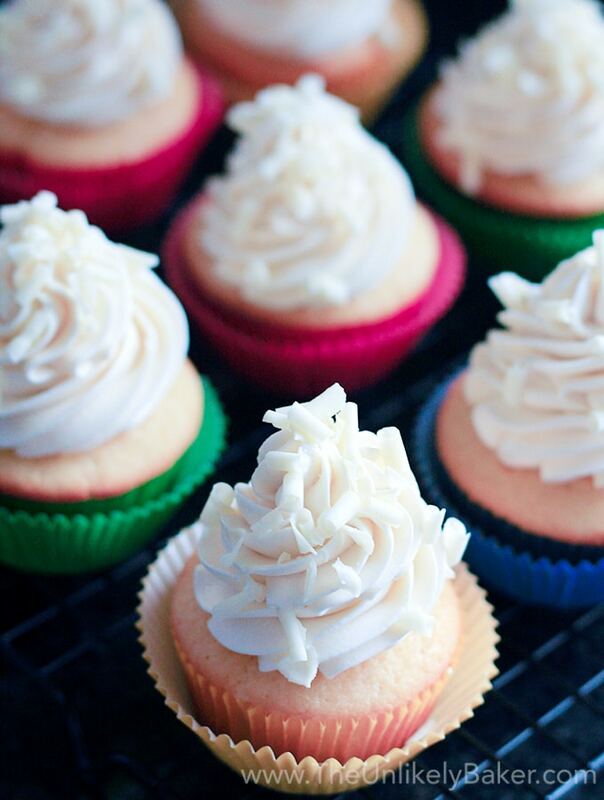 White chocolate cupcakes with raspberry filling topped white chocolate cream cheese frosting. A luxurious treat for white chocolate fans. Preheat your oven to 350F and line a cupcake pan with paper liners (this recipe yields 12 cupcakes). In a medium bowl, whisk 1 1/2 cups cake flour, 1 teaspoon baking powder, 1/2 teaspoon salt and set aside. 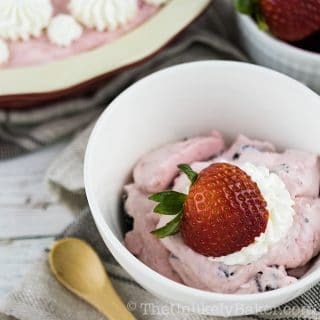 In a smaller bowl, stir 1 cup milk and 1 teaspoon vanilla. 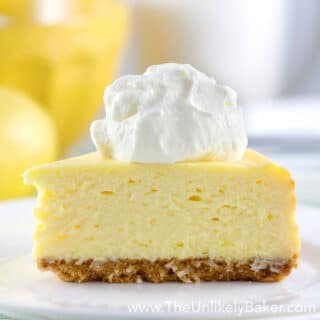 Using a handheld electric mixer or a stand mixer with the paddle attachment, cream 1/4 cup butter and 2/3 cup sugar until the mixture is paler in colour and creamy (about 2-3 minutes on medium-high speed). Add the eggs one at a time ensuring each addition is well incorporated. Scrape the bottom and sides of your bowl as needed. Add the melted white chocolate and stir. Switch to low speed and add a third of your flour mixture, half of your milk mixture, another third of your flour, the rest of your milk and finally the rest of your flour - beating well after each addition. Continue to beat until the mixture is smooth and no noticeable lumps of flour remain. Cool in the pan slightly before transferring to a wire rack to cool completely. 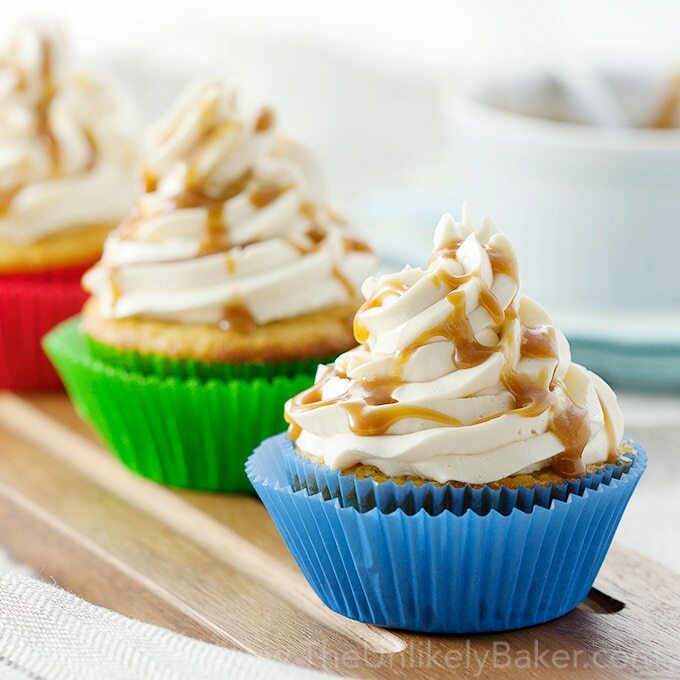 If you are filling the cupcakes, you can use a bismarck tip or simply cut a small hole in the middle of your cupcakes about an inch in diameter and spoon a dollop of jam in it. Make sure not to overfill. Top with frosting and decorate as desired. Cut your cold cream cheese into 4 portions to make it easier to cream with the butter. 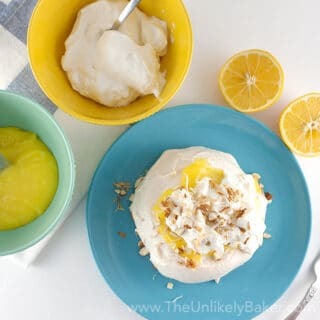 Using a handheld electric mixer or a stand mixer fitted with the paddle attachment, beat your cream cheese portions and 1/4 cup butter on medium-high speed until smooth and creamy. 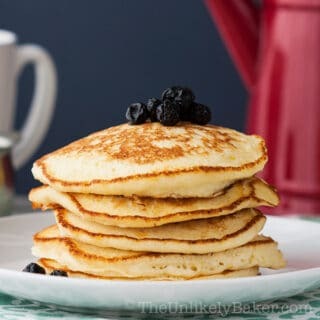 Add a cup of confectioner's sugar a little at a time beating well after each addition. Add the melted white chocolate and 1 teaspoon vanilla and continue to beat until well incorporated and your frosting is smooth and creamy. 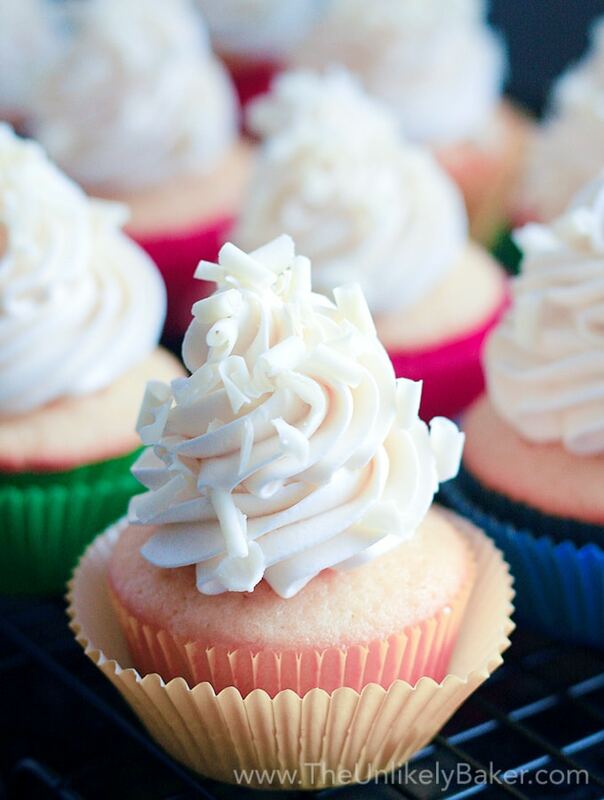 Did you make white chocolate cupcakes with raspberry filling? Tell me about it in the comments section below. I’d love to hear how it went. What’s your favourite white chocolate treat? This recipe sounds great, but 1 tablespoon vanilla seems excessive. Is that supposed to be 1 teaspoon? Hi Darcy you’re right it’s supposed to be 1 teaspoon. I’ve updated the recipe. Thanks for letting me know! I love anything jam filled anything! These look yummy and I can’t wait to try them. These are my two favorite flavors. There’s an ice cream inlove that combines these two flavors and now I’m craving it and these cupcakes. Yum! I gotta hunt that ice cream down LOL! Have a great week Saidah! 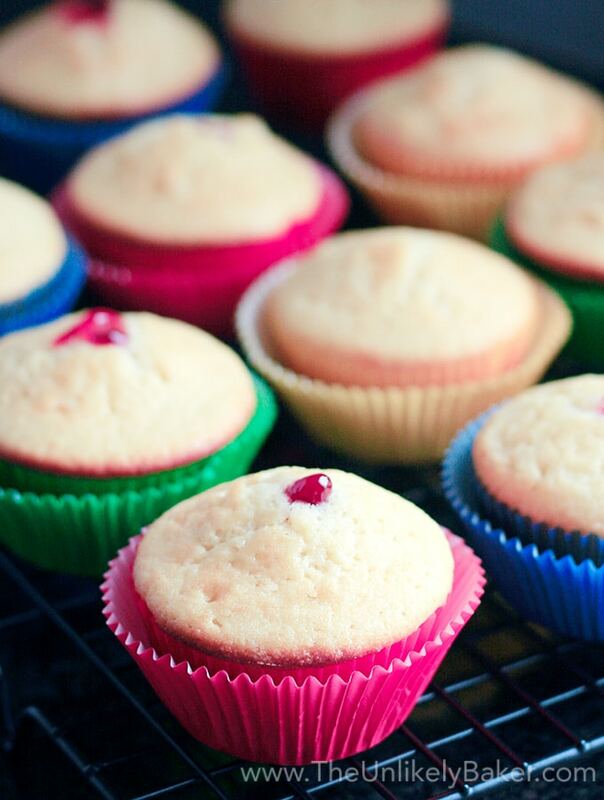 Mmmm… I’ve always loved the taste of chocolate and raspberry but never thought of white chocolate cupcakes before – this sounds like a whole new level of amazing! 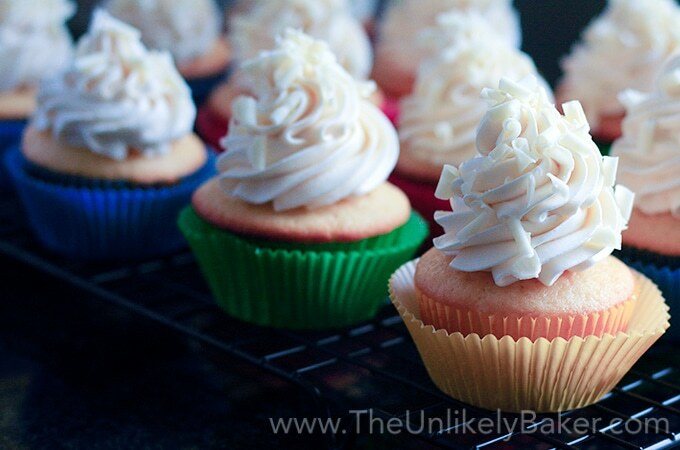 White chocolate cupcakes? OOh now I am in heaven this looks so good. You always have the best cake recipes I swear! Yum. My girls are both having birthdays soon so I might have to make these! Nice! A most wonderful birthday to your girls! Those are so pretty, I love the subtle pink color! 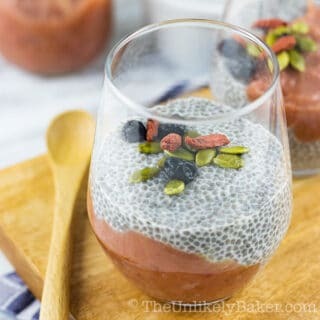 Wow these looks absolutely delicious will make for Holidays! What a great way to start the day…reading about cupcakes! I love the way you write Jolina your humour definitely comes through! Thank you for transporting me on a cupcake adventure! I must make these! Anything with raspberry is my favorite. White chocolate and Raspberry sounds like a match made in heaven. 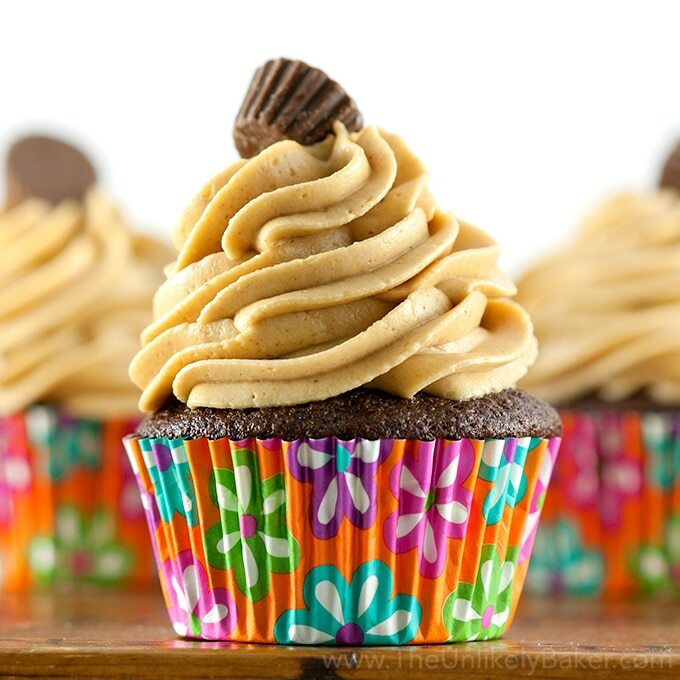 What a perfect treat, love cupcakes for parties might inlcude your recipe in my upcoming celebration menu. I am not a big fan of chocolate whether it’s white or dark. But your amazing pics and recipe made me crazy to just have it now. Lovely and looks delicious . White chocolate and raspberry seems like a good combo. Omg can we say yum?!?! These cupcakes look absolutely amazing!!! Must give your recipe a try!! White chocolate and raspberry is such a yummy combination of flavors. These look scrumptious. This is possibly the best sounding cupcake ever! White chocolate, raspberry and cream cheese frosting! Oh boy!!! Raspberry and white chocolate go so well together. These cupcakes sound delicious. 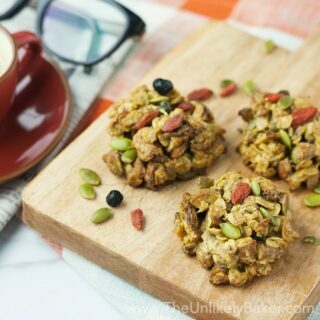 Perfect with an afternoon latte. While I’m not a fan of white chocolate, these sound delicious. I know quite a few people in my family who would love this. Not enough sweets have raspberry filling. Its one of my favorites and these sound incredible. Huge white chocolate fan here and I cannot wait to try these beauties. Yay! Hope you like them. I love this recipe! I need these in my life! Nothing is better than a raspberry filling! Such a cute cupcakes! And all this white chocolate, looks delicious! I think I need them in my life. White chocolate and raspberry they are best combo. Great valentine recipe too. That cream cheese filling is just die for. every bite has level of flavors you are right these should be delicious. It’s great that the flavors ended up coming together so well. I think these sound really good! The raspberry jam sounds like a good idea to me. I rarely make cupcakes with filling. You make it look so easy… I want a bite now. Years ago, I was more of a white chocolate fan over milk or dark. These days I opt for milk or dark over white, but I still love it all! Like I would turn these down, lol 😀 Love the jam filling inside and the frosting on top looks like little trees….too cute! Have a great weekend, Jolina! I like white and dark equally I think. Milk not so much though yeah, would not say no LOL! They do look like snow capped trees don’t they? 🙂 Thanks Dawn! Have a wonderful weekend yourself!